Posted by Noah Poser on April 11, 2019 in Sports, Top Stories. Despite being the underdog, the Ferris disc golf team’s chemistry and teamwork have led them to yet another national championship. The team took home their third national championship in five years Saturday, March 30, and this time took down North Carolina State University (NCSU). Even though Ferris is one of the smallest schools that competes, it has emerged as a national powerhouse. They have done this through a never-changing mindset. 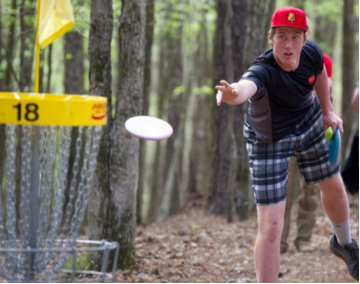 The team, according to Ferris heavy equipment junior and Disc Golf Club President Patrick Nemmer, goes into every match believing that they’re the underdogs, despite the national titles in 2015, 2017 and now 2019. A lot of it had to do with the culture — a culture that led the team to where it is today — as well as the camaraderie and the team’s ability to work well together to better each other as both people and athletes. Ferris had a one-stroke lead after day two in Applin, Georgia, but then NCSU took a one-stroke lead midway through day three. Finally, Ferris took a two-stroke lead going into the final round. The outcome was in limbo until the final hole. But it wasn’t always meant to be this big. Club adviser Leonard Johnson founded the club. After initially planning on an Ultimate frisbee team, the club developed into one for disc golf. They eventually started playing with the big guns, having competed in nationals since 2013 against some major universities. Nemmer said the national title was exciting for him and his teammates, two of whom are ending their disc golf careers and one who has been a part of the team for all three titles.